136 companies declared higher dividends in the past month, with an average increase of 9.45% over their previous payouts. 2 new Champions, 16 new Contenders, and 10 new Challengers. 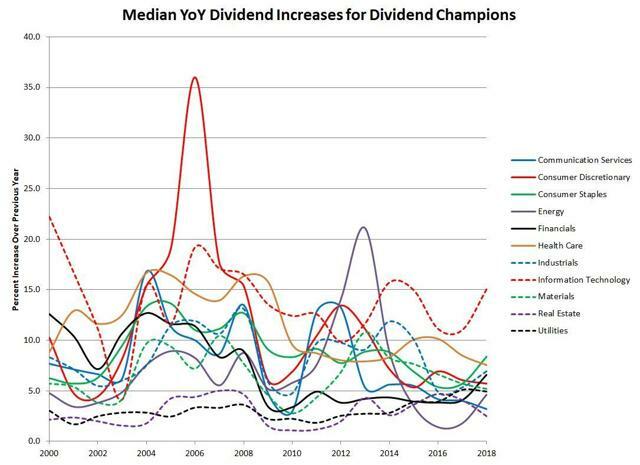 The Dividend Champions list is a monthly publication tracking companies with a history of consistently increasing their dividends. Wider in scope than the well-known S&P 500 Dividend Aristocrats and Nasdaq Dividend Achievers, the Dividend Champions covers all companies listed on exchanges in the United States. In order to be included in the list, the annual split-adjusted dividend payout of a company (based on calendar year) must be consistently increasing. 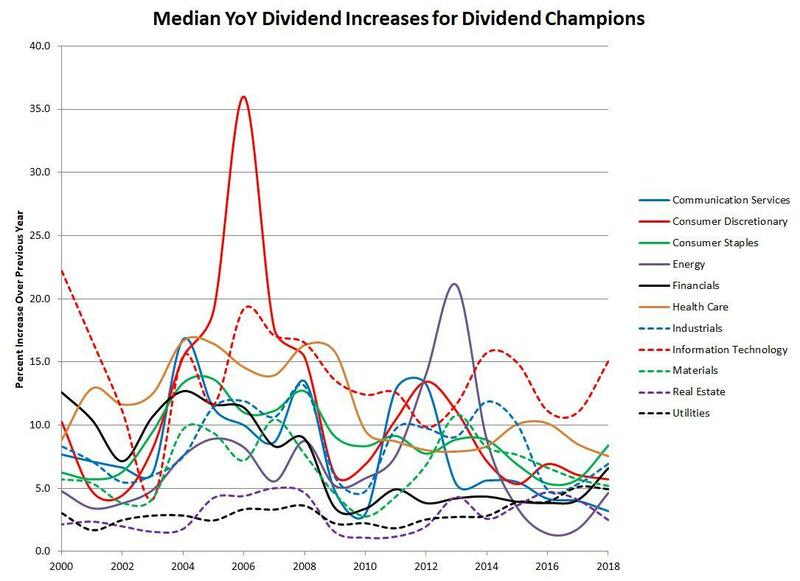 The Dividend Champions list is separated into three categories based on how long companies have maintained the streak of annually increasing dividends: Champions (25 or more years), Contenders (10 to 24 years), and Challengers (5 to 9 years). The Dividend Champions list was created by David Fish in 2007 and is currently maintained by Justin Law. The Dividend Champions list may be obtained for free for personal, non-commercial use from the DRIP Investing Resource Center. Data in the Dividend Champions list is provided "as is" with no guarantees of accuracy, completeness, or timeliness. 136 companies declared higher dividends in the past month, with an average increase of 9.45% over their previous payouts. The latest version of the CCC List is available at the DRIP Investing website and is also attached here. The CCC universe has increased to 867 companies. The average dividend streak remains steady at 14.2 years. The average yield has dropped slightly to 2.81% from 2.86% the previous month. Additions to Challengers: Intel Corp. (INTC), Marine Products Corp. (MPX), Unitil Corp. (UTL), Berkshire Hills Bancorp, Inc. (BHLB), Eli Lilly & Company (LLY), Enviva Partners LP (EVA), Community Healthcare Trust, Inc. (CHCT), Woodward, Inc. (WWD), Bankwell Financial Group, Inc. (BWFG), and Equinix, Inc. (EQIX). Essex Property Trust (ESS) and NextEra Energy, Inc. (NEE) have been promoted to Champions. Activision Blizzard, Inc. (ATVI), Brookfield Renewable Partners LP (BEP), BlackRock, Inc. (BLK), Cohen & Steers, Inc. (CNS), First Interstate Bancsystem Inc, (FIBK), Home Depot Inc. (HD), Moody's Corp. (MCO), Omnicom Group Inc. (OMC), Douglas Dynamics Inc. (PLOW), Pioneer Bankshares Inc. (OTCPK:PNBI), Primerica Inc. (PRI), Retail Opportunity Investments Corp. (ROIC), Standard Motor Products Inc. (SMP), Simon Property Group Inc. (SPG), United Parcel Service Inc. (UPS), and Wendy's Company (WEN) have been promoted to Contender. Clearway Energy (CWEN) and Kraft Heinz Company (KHC) have cut their dividends. Western Gas Partners LP (WES) has been acquired by Western Gas Equity Partners LP. Vectren Corp. (VVC) has been acquired by CenterPoint Energy (CNP). Ever wonder which sectors are best at dividend growth? This chart should interest you. A big caveat is that the data used to generate this is based only on the current Dividend Champions (not Contenders or Challengers). So there is survivor bias as this doesn't include all the companies which have cut their dividends or which have been acquired. With only 133 companies, some sectors are underrepresented - there are only four companies in Info Tech, Energy, and Communications; only five in Healthcare; and six in Real Estate. The other sectors are fairly well represented, with particularly large numbers in Financials and Industrials, so this chart may be more representative of those sectors. Feedback Needed: I've made quite a few changes to the list over the last few months. I'm content with the current format of the list and don't have any more major changes planned in the near future. Please let me know your thoughts. Errors? Let me know! I don't have time to manually verify every piece of data presented in this list. If you run across something that is clearly wrong, let me know in the comments or send me a message and I will do my best to get it fixed. Disclosure: I am/we are long INTC, HD. I wrote this article myself, and it expresses my own opinions. I am not receiving compensation for it (other than from Seeking Alpha). I have no business relationship with any company whose stock is mentioned in this article.